Forward the (R)evolution - in Harmony with the Earth: Thanks Message to everyone who made this journey possible! Thanks Message to everyone who made this journey possible! 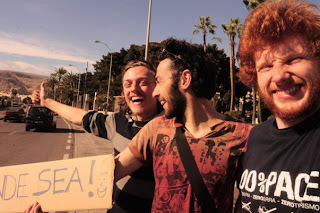 We are the one who have been traveling for more than one year hitchhiking from the Netherlands to Mexico passing through Europe, Morocco, the Atlantic Ocean and going up from Brazil to Mexico city! We called it the journey of humanity because it was only possible thanks to your help and your support. We want to thank you all for your faith, trust, smiles, nice word, rides, love and everything you gave us! Without you we would still be in Europe. Some people say traveling open the mind. Surely, put yourself on the road like a globetrotter open the doors of the mind. But not only this, traveling is also about opening the heart. A journey is like to kick in the door of destiny, open yourself to the world and go with the flow. To travel is to leave your heart take control of yourself and let it beat in harmony with all the hearts of the world. Thousands of conclusions pop up in our mind when thinking about the journey... but everything come to one single feeling: Love. This adventure was also a journey of love, a journey inside the heart of our world, we learned to love and to be loved by others. We met the true human beings, our brothers and sisters who gave us a hand at any moment. After 26.000 kilometers, discovering about 18 countries with more than 400 vehicles, thousands of people with whom we shared some minutes, hours, days, weeks... always with love and happiness. We can only say one thing about this to the world: we are all sons and daughters of our beautiful mother earth, connected to each other... united. We have all the love we need... we just need to share it! Thanks to you all for opening your hearts, your houses, your cars to us, humble travelers. Thanks for being on this planet and thank you for believing in us. We too believe in you and we now that all together we can achieve to make the change that we all need to live better, in harmony with the nature and all earthlings, in peace, justice and love. 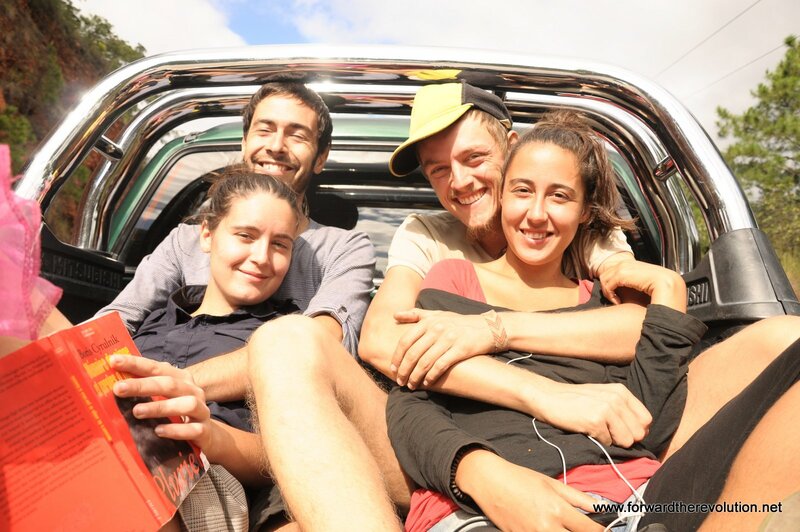 Our Dear Brother Nicola went already back to Europe from Brazil, Benjamin is staying in Mexico City with a new project: the “ecodepa” (ecodepa.blogspot.com), a flat where he lives with some other friends, all trying to find the alternatives to live in a more sustainable way inside a concrete jungle! Nieves and Raphael are on their way to go back to Berlin where they want to welcome a new light, a future baby! They will go hitchhiking, keeping on traveling without money. There plan is to find a ride back in an airplane from Texas or some other part of the US to cross safe the Atlantic Ocean in order to get back to Europe! Lot of love for you, keep on with the good heart, open yourself and be the change! Thanks for everything! "life is just a ride, and we can change it whenever we want to. It is just a decision between fear and love. "Bill hicks. Congrats guys! What a journey! Loved it... only wish I could have done it with you.